Looking for a quote to buy Ice Melt and Deicer by Kissner in Rochester NY, Ithaca NY and Western New York at the best prices? The Duke Company proudly carries a complete range of Ice Melts and Deicers by Kissner available in portable 50 pound bags, pallets and in bulk. Ice Melts and Deicers are essential to Ice Control Experts in managing heavy snow and vastly improving the productivity of snow plowing, snow shoveling and snow blowing. 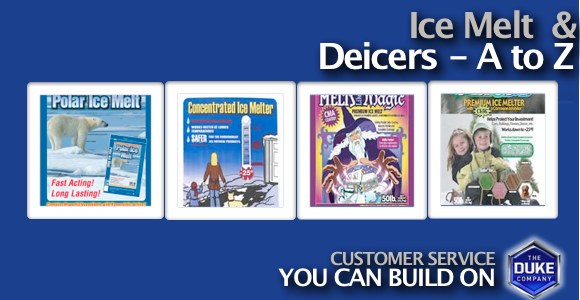 Ice Melts and Deicers are available in a range of strengths and concentrations. Please read the safety information, as Ice Melts and Deicers can create harm to concrete surfaces, landscaping and pets. Note that there are many Ice Melts and Deicers carried by the Duke Company that are more environmentally friendly, green-friendly and pet-friendly. Ask our ice control experts about which product is best for your specific ice and snow melt application. We would be glad to assist you. Looking to buy Ice Melt in Bulk, by the Pallet or Bag at Exceptional Pricing?